The objective of the ITER program is to understand and control nuclear fusion. Since 2009, Bertin has been actively involved in this ambitious project through the development of diagnostics instruments for the Tokamak reactor. These tools seek to control and measure plasma in an effort to understand and analyze the physics of the reaction. Fusion is the nuclear reaction that feeds the Sun and the stars. Potentially, it is a virtually inexhaustible source of safe energy that has a low impact on the environment. The International Thermonuclear Experimental Reactor (ITER) is an international experimental program (Russia, USA, EU, Japan, China, etc.) seeking to verify the scientific and technical feasibility of nuclear fusion as a new energy source. Once under control, this could help meet the electricity needs of future generations. The program is an essential step between its predecessor research facilities and its successor fusion plants. 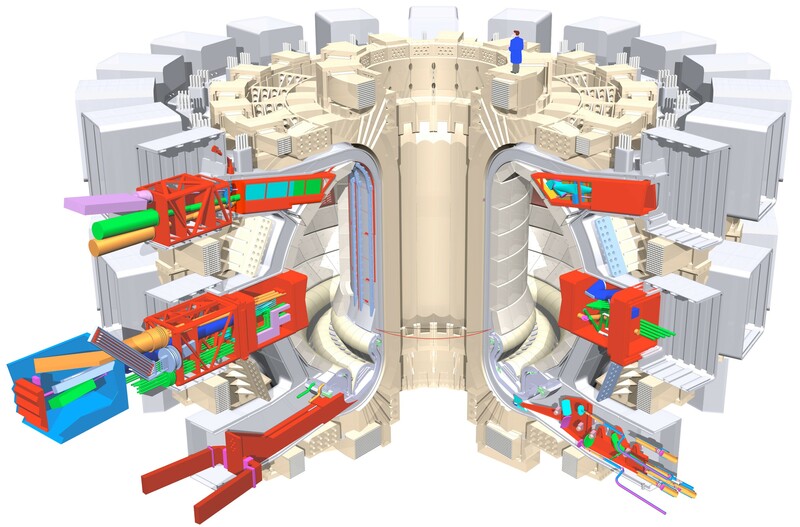 Based on its experience from the Megajoule program, Bertin has aligned itself with instruments designed to closely analyze the fusion plasma to contribute to the conduct and safety of experiments and acquire the parameters that will be exploited by physicists. Since 2009, Bertin has been participating in this ITER program through various contracts with ITER Organization in Cadarache, Fusion For Energy in Barcelona and the Princeton Physics Plasma Laboratory in the United States. The involvement of the group is particularly important for the development of future diagnostic instruments for the reactor (Tokamak). Indeed, it is essential for experiments of this scale to be endowed with a large number of instruments that will control the plasma and take many measurements to understand and analyze the physics of the reaction. Bertin worked on the detection of hot spots inside the Tokamak to avoid damage to the machine during the reaction (VIS IR Camera), on the IVVS (In Vessel Viewing System) which measures the erosion of internal components and even on the design of ITER portholes which are subject to very high environmental and safety constraints. These instruments are strategically important for the success of the experimental mission. They implement state-of-the-art technologies and allow the instrument to achieve unprecedented performance. The Bertin teams are in control of the very high environmental, safety, security, reliability, cleanliness and quality assurance requirements, which allows us to receive the full confidence of our customers and partners.